lets start our exercise by opening Creo Elements /Pro formally Pro Engineer. I will suppose you have very basic knowladge befor starting this exercise. 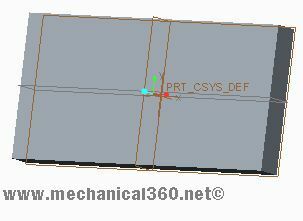 now select the front surface of your solid plate and click on sketch button so you can sketch a feature for our exercise In sketching window sketch a circle near to the left width of plate. 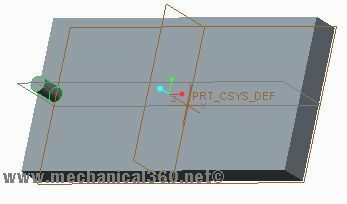 just click on done and than click on the extrude button.so we want to extrude this circle in up to the height of 10 units. 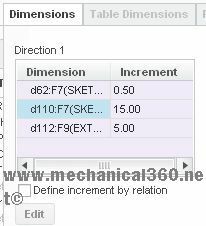 Now click at any of these dimension and than enter the increment value that you want.Than press ctrl key hold it and select other dimension and enter increment or detriment and use same procedure for 3rd dimension. 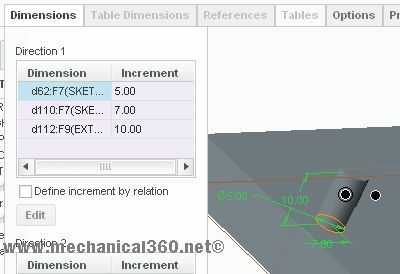 in above fig i select all the dimensions that i want to patteren using above described method.after this i changed dimensions accordingly.see thi fig below for increment values. 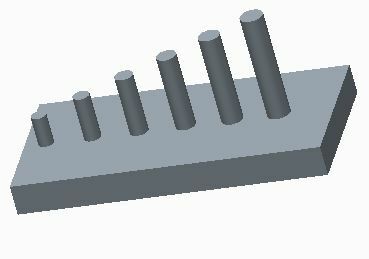 after completing above step now just click at done button and you done :) your part should be look like this if you follow my dimensions.